Kick A Rock: I Drink and I Know Things: Game of Thrones Sn 6, Ep 5 – "The Door"
Ep 5 – "The Door"
We will definitely be getting into everything that happened north of The Wall, but we'll save that until the end. So before we venture down that Weirwood Tree Rabbit Hole let's briefly touch on some of the other scenes that played out in what could easily be considered a mid-season finale. I used to hate Sansa Stark. She was whiny, spoiled, and kind of an awful person to other members of her family at times. She even wanted nothing more than to give Joffrey golden haired babies at one point. I hated her. Well, it only took 55 episodes, but after she stood toe to toe with Littlefinger it's safe to say that her fan club just grew ten fold. She even gave him the old "You're either too stupid or you're in on it" line that sounded like it came straight out of the movie "Casino." So you can consider me a Sansa fan! Also consider that Sansa may be in danger because of it. We all know what George likes to do to characters that we love to root for. A girl continues her training and is assigned her final exam. These Faceless Men certainly seem to have an affinity for the dramatic. She is tasked with "giving the gift" to an actress who is portraying Cersei Lannister (who still happens to be on Arya's list). There was a lot of time spent in Bravos this week. Especially on that play that seemed to recap Arya on season one in case she forgot what happened to her father. It will be interesting to see whether or not she can really become no one. There was a Kingsmoot in Pyke and we now have a new king of the Iron Islands! It's Yara and Theon's uncle! He paid the "Iron Price" and.... The Drowned God........and he's going to take over Westeros by seducing the Mother of Dragons and.....Oh MY GOD WHO CARES! I did think it was a bit funny to see Yara and Theon steal an entire fleet of ships with a group of roughly a dozen people. All in all the Kingsmoot was exactly what it sounded like, a moot point. Unfortunately for us, what is dead may never die. Did you cry a little when Jorah told Dany that he loved her? Or how about when she told him to find a cure and then come back to her? Did you? If not, then you have no soul. I really hope this isn't the last we will see of Jorah the Andal. Kinvara the High Priestess is a scary individual. If you can freak out Varys like that then you're not to be underestimated. Or rather the Lord of Light isn't to be underestimated. Or something like that. However it works with those red priests. Couldn't help but notice that Kinvara is wearing the same choker around her neck that another Red Woman we all know likes to wear. It makes you wonder if she was elected to be the First Servant of the Lord or if she was literally the FIRST servant of the Lord. It was tragic. It was sad. It was damn heroic. 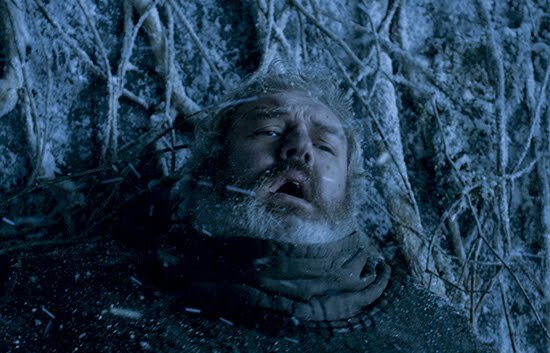 Let's pour one out for our friend Hodor. In a great "WTF" moment that this show seems to thrive on, we get the origins of Bran's faithful companion and protector. As hard as this scene was to watch it also opened up the door (no pun intended I swear) to numerous possibilities for the future of Bran's story and the story of "A Song of Ice and Fire" overall. Bran wargs into Hodor in the present AND in the past simultaneously which causes Willis (young Hodor) to experience his own death in the future which in turn causes him to become the Hodor we all know in the present. Alright kids, join me as I put on my Valyrian tin foil hat for a minute. This means that this always happened this way. Bran had to go back into the past so that Hodor could become who he is and save him in the future. My question is, how many times has Bran done this? Will there be other events that he has influenced in the past? Ned once told him that he was named after Bran the Builder, a man who lived hundreds of years ago and built The Wall. What if Bran Stark was/is Bran the Builder and somehow built The Wall in the past to keep the White Walkers out in the future and...my head hurts. It's an amazing revelation that I think will definitely come into play later on in the story. Unfortunately, it came at the cost of Hodor's life. So the next time you're about to take an elevator ride and somebody says, "Hold the door," try to hold back your tears as you remember everybody's favorite half giant. Was Sansa letting Littlefinger live a smart decision? Doubtful. Why couldn't the name Arya was given have been...oh I don't know...Ramsay Bolton! Letting in the Red Priests to Meereen is a lot like letting the Sparrows in to King's Landing. Not great. I hope Bran wakes up soon and we get to see who's in that tower. Are Yara and Theon stealing their uncle's plan to team up with Dany? Do I care? Just get her to Westeros for the love of God! Will we see a Zombie Hodor now? Because that's terrifying. Next week's episode (below) shows us a glimpse of what might be that battle we've been waiting for at King's Landing. Speaking of that, what did the High Sparrow tell Tommen which he in turn told Cersei? A secret about about the Tyrells' involvement in a certain "Purple Wedding" perhaps? As usual please let me know your thoughts and comments and any theories you might have about Game of Thrones. Here's last week's recap for "Book of the Stranger" in case you missed it. Thanks for reading!